The Bracelet is a welcomed Christmas gift and is rich in history, variety and styles. The quintessential accessory for any wardrobe, this accessory can be worn daily or for special occasions and adds a final polish to the well-dressed man or woman. This jewelry dates back to the Egyptian times. At that time, materials like bones, stones, and wood were used to represent religious and spiritual interests. It’s thought that even mummies were adorned with bracelets to protect them in the afterlife. In ancient Greece, a bracelet woven of red and white string was often worn on the first day of March through the end of summer, protecting the wearer’s skin from the sun. And in parts of India, you were able to determine the marital status of a woman by the number of bangles (a type of bracelet) she wore — and this is still true today. Charm bracelet: special and unique charms, such as small decorative pendants, these charms represent the important things in the life of the wearer. Bangles: These are bracelets made with metal, sometimes also made of wood, or glass and are solid in form. When wearing such bangles any movement of the arm causes the bangles to create sounds; often similar to that of wind chimes. Beaded bracelets: Made from a variety of different beads of different colors, shapes and sizes these bracelets are common in Arizona, Nevada, Texas and New Mexico due to the Indian heritage of these states. 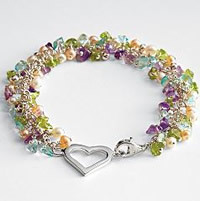 Link bracelets: Made from a variety of metals, gemstones and the like, these bracelets are connected or linked together. Wristband bracelets: Typically worn around one’s entire wrist, this kind of bracelet is made with various materials including metal, and varies in width for fashion and/or informational purposes. It’s important to know that both men and women wear these accessories today. There is a large market for men, including a man’s gold bracelet, man’s diamond bracelets and even man’s magnetic bracelets. Not only are bracelets fashion accessories for women, but there are also mother bracelets (for new mothers) and baby bracelets (for newborns). When contemplating giving a bracelet as a Christmas present, one cannot go wrong with timeless classic diamond tennis bracelet, or the customized charm bracelet. The sleek and stylish nature of this kind of Christmas present is sure to put a smile on the face of special someone this holiday season. The bracelet is a welcomed Christmas gift and is rich in history, variety and styles. The quintessential accessory for any wardrobe, the bracelet can be worn daily or for special occasions and adds a final polish to the well-dressed man or woman. Bracelet jewelry dates back to the Egyptian times. At that time, materials like bones, stones, and wood were used to represent religious and spiritual interests. It’s thought that even mummies were adorned with these pieces to protect them in the afterlife. In ancient Greece, a bracelet woven of red and white string was often worn on the first day of March through the end of summer, protecting the wearer’s skin from the sun. And in parts of India, you were able to determine the marital status of a woman by the number of bangles (a type of bracelet) she wore — and this is still true today. Beaded: Made from a variety of different beads of different colors, shapes and sizes these bracelets are common in Arizona, Nevada, Texas and New Mexico due to the Indian heritage of these states. Wristband : Typically worn around one’s entire wrist, this kind of bracelet is made with various materials including metal, and varies in width for fashion and/or informational purposes. It’s important to know that both men and women wear bracelets today. There is a large market of bracelets for men, including a man’s gold bracelet, man’s diamond bracelets and even man’s magnetic bracelets. Not only are bracelets fashion accessories for women, but there are also mother bracelets (for new mothers) and baby bracelets (for newborns).